Greek plays and theater played a huge role in ancient Greece. People of Ancient Greece around the 5th century, took great interest in the origins of tragedy and comedy and wondered where they originated from. The Greeks used drama as a way of somewhat investigating the world that they lived in, and as a way of discovering the real meaning of being human. Theater was such a big deal that prisoners were often temporarily released from prison, just to attend the plays. Huge outdoor theatres were made to contain a capacity of about 15,000 people along hillsides. Only three actors were used and the chorus generally told the story of the play; the actors would use masks and would play as multiple characters. 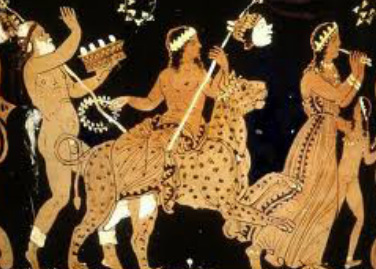 Originally, plays were performed to honor the Greek god of wine and harvest, Dionysus. As time elapsed however, many different gods were incorporated into the plays. There were three different types of plays. Tragedies: Tragedy was the first genera of plays that the Greeks invented; where usually, one or more of the main characters would suffer a catastrophic ending. Aristotle had classified tragedies as a “catharsis experience”, which referred to the impact of tragedies tugging at our heart through pity and terror. These feelings removed the concerns and worries, which made people aware of the goodness that comes out of suffering. Comedies: Comedy was the next genera of plays created by the Greeks. Comedies always had a happy ending. These plays typically mocked men in power for their foolishness and greed. Satires: Satires were the final play types. Satires made fun of mortal legends and of real people. Leaders would be made fun of, but never the gods. Satires often affected people’s opinions about the current political events taking place and dealt with stories of a “mythical past”. The Ramayana and the Mahabharata are two great Indian epics, and play as the most important works of literature in South Asia. Starting at an early age, most children are told the stories of the Indian epics and learn from the stories characters, incidents, and grasp the ethics and wisdom of common life by hearing these stories. The epic age in India is classified roughly around 1000 to 600 B.C, which was when these epics were created. The epics serve as a huge part of the religious and mythical scriptures, and the historical roots in India. These epics are a way of binding together the people of India among the caste system. The Ramayana and Mahabharata along with many other Indian epics, were originally written in Sanskrit. Hero worship plays a big part in Indian culture. The Ramayana teaches Indians to perform their dharma. Following one’s dharma is a stressed lesson in Indian culture, because it will lead to the correct and consistent performance of one’s duties. Dharma decides one’s position in the next life. The Ramayana is a story about the crowmed prince of ancient Ayodhya, and an “earthly incarnation” of the Hindu god, Vishnu. Rama serves as the hero of the story, the epic tells of Rama’s quest when he is banished from his kingdom by his step-mother with his wife Sita. Rama and Sita are both examples of people following their dharma. Two Indian holidays are held to celebrate certain events that took place in one of the famous Indian epics, the Ramayana. The beliefs of Hinduism is based on one of the Mahabharata stories, the Bhagwad Gita. Therefore, the Mahabharata provides as the base of the religion. The epics provide us with an understanding of the way that the society was ruled at that time.